BUILT IN THE U.S.A!...FULLY ASSEMBLED AND READY TO PLAY!! SO MUCH EASIER TO HIT those LONGER FAIRWAY SHOTS! Yes, this is a BRAND NEW set still in the factory Wrap! The Manufacturer's Suggested Retail Price for this set is $199.95 ..Your price is MUCH BETTER!! 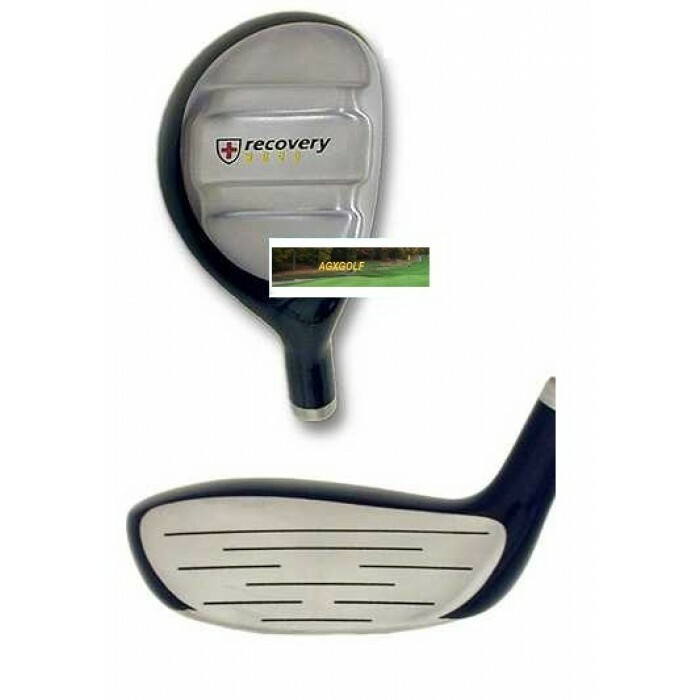 HIGH LOFT RESCUE TYPE fairway woods have become known for the distance and loft advantage they give especially on uneven fairway shots and in low to medium rough. We all know that Standard Fairway woods and 2, 3 and 4 irons are difficult to hit, let alone hit them well consistently! That's why more Pros are going with these style Utility clubs. You will typically get better distance and better precision and still be able to watch the ball land softly! There is no better for shots that have to be executed on a little less than the optimum lie. Regular woods can be difficult to hit, even on an optimum fairway lie shot, so give yourself the advantage that the RESCUE clubs gives for the less than optimum lie and to get the high trajectory required for a soft landing. And, don't you know, hitting a few more good shots will make your golf that much more fun!! HERE ARE TYPICAL DISTANCES FOR THE AMERICAN GOLF: RECOVERY WOODS (SET OF THREE WOODS). LARGE HITTING Face with a Very Low Profile!! This gives the club a larger sweet-spot and helps the club head zip through that thick rough! One of the many features designed into these Recovery Woods is the railed sole which helps keep the club face square through impact. Combined with the solid 17-4 Stainless Steel construction; you have a very valuable Fairway Wood that will STAND UP TO ANY GOLF COURSE! The low center of gravity makes for soaring Tour-Style golf shots. It's so much easier to get a nice high loft from the Fairway! Finely Crafted and designed with the best technology, this Rescue Fairway Wood can help turn you into a Low Handicapper!. For MORE DISTANCE, these RESCUE WOODS are fitted with REGULAR FLEX GRAPHITE SHAFTS. These superb Recovery clubs are built in our Highland, Michigan facility. We know you will enjoy playing these fine sets as much as we enjoyed crafting them!! MEN'S TALL (+1.5): For HEIGHTS of 5' 11" to 6' 4"
MEN'S EXTRA TALL (+2.0): For HEIGHTS of 6' 4'' to 6' 9"
Stated Shipping charge for contiguous U.S.A. only. Other destinations: PLEASE CONTACT US; Shipping will be billed at our actual shipping cost.